Thank you again for hopping by each and every week. This hop wouldn't worth 'hopping by' if it wasn't for all of you! I am a new follower, thanks for hosting a great hop! I hope you and your hubby had a special day celebrating his birthday! As always, thank you for hosting... hope you're having a great week! 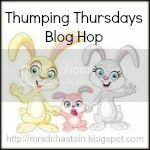 I love coming to your blog hop! Each week there are so many new and great ideas! Congratulations on the blog hop success! Thanks for hosting & God bless! Hope 2013 is off to a great start for you! Hi- Thanks for hosting. I'm a new follower on FB. http://www.facebook.com/AHappySong. Thanks for hosting and have an awesome weekend. Diana, thank you so much for hosting my dear! I followed you from Chubby Cheek's BH. I will link up for this one too!